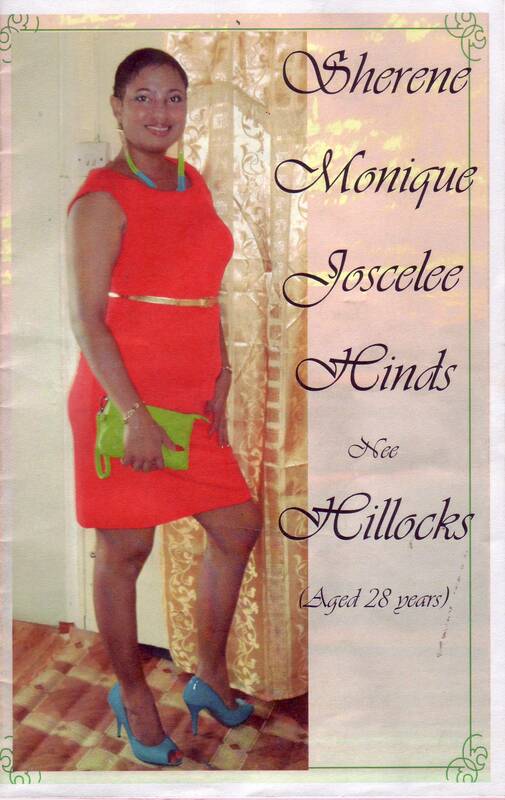 MS NERISSA GELINE SAM better known as MANDELLA of Coulls Hill died on Friday 23rd May at the age of 32. The funeral takes place on Wednesday 4th June at the New Testament Church of God at Coulls Hill. The body lies at the church from 2:30 p.m. The service begins at 3:00. Burial will be at the Troumaca Cemetery. MR CYRIL EMMANUEL CHARLES THOMAS better known as MAN of Rose Hall died on Wednesday 21st May at the age of 83. The funeral takes place on Saturday 7th June at the Rose Hall Methodist Church. The body lies at the church from 1:30 p.m. The service begins at 2:30. Burial will be at the Rose Hall Cemetery. MR. ST CLAIR HAMILTON KYDD formerly of Richland Park died on Tuesday 27th May in Toronto, Canada at the age of 69. A memorial service takes place on Sunday 8th June at the Toronto West Seventh Day Adventist Church at 2:00 p.m.
MRS SHERENE MONIQUE JOSCELEE HINDS nee HILLOCKS of Barbados died on Saturday 26th April in Barbados at the age of 28. The funeral took place on Tuesday 10th May in Barbados.